Free parking and Wi-Fi plus an accommodating multilingual staff make Red Roof Inn a solid choice for our guests headed to San Diego. This hotel is also valued for its great location and cozy contemporary rooms. There are 67 non-smoking rooms spread across three floors at Red Roof Inn. Accommodations feature cable TVs modern furnishings and microwaves. The hotel offers a business center and a free continental breakfast each day. 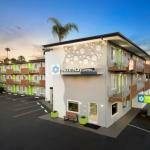 The hotel is located five-and-a-half miles from San Diego International Airport and is situated in the center of Mission Bay known for its restaurants shops and Mission Bay Park. Other popular attractions including SeaWorld San Diego and Pacific Beach can be found five miles from the property. Those who want to take advantage of public transportation can head to the Old Town Transit Center less than four miles away.